OLCAR is the record of Amateur Radio contesters world wide, who placed either 1st, 2nd or 3rd in any of the TARA digital contests. This Permanent Record, will remain here forever as a statement to their contest operating skills. Wall paper is nice for you to look at on your shack wall, but OLCAR is nice for the World to look at. :) Enjoy. 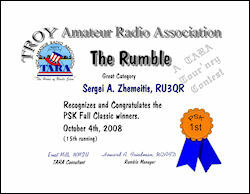 2007 Category deleted from Rumble. Lack of interest.